The PSC’s strike authorization vote is scheduled for May 2-11. Click here to learn more about how to vote by mail, by phone or online. Thousands of PSC members have already made a public pledge to vote YES for strike authorization. We’ll be sharing some of their reasons for voting yes here over the next two weeks. If you’d like the union to share your reason for voting YES, send a message to fclark@pscmail.org. Share your reasons for voting YES with the hashtag #CUNYStrikeAuth. You can also download this image to use as your profile picture. I am voting YES for the strike authorization because I want a high quality public university for the City of New York. Many of us work extremely hard for this university and have to teach in overcrowded classrooms with an embarrassingly large number of students. In addition, many of us at CUNY work many hours doing research and strengthening our scholarship while bringing grant money to the University. We provide undergraduate and graduate students with meaningful research/scholarship experience outside of the classroom. We also contribute to the University and the community in many other ways through our service. Yet, CUNY has failed us. We have been five years without a contract and six years without a raise while our students’ tuition has increased. This is especially dramatic for new faculty (assistant professors) and adjuncts, but it makes life very hard for all of us in a place like NYC. A number of colleagues have left CUNY (sadly some of the most successful people) to go to better paid and less demanding jobs. I myself almost left CUNY three years ago. Without a fair contract, we will not be able to recruit and secure excellent faculty. And we need excellent faculty to make CUNY great and to better serve our students. That’s why I support and pledge to vote YES for the authorization of strike. Although all CUNY employees have worthy demands, the biggest motivation for me to participate in the civil disobedience action was to state my discontent with the unfair wages and job security situation that adjunct professors face. As someone who deeply cares about public higher education as the only option for lifting people out of poverty, it is unacceptable to me that thousands of highly educated and caring professionals who teach our low-income students are in poverty themselves! I'm voting yes on the strike authorization vote because everything we have is because we have fought together, as one Union. I will never forget the fear I experienced when, as an adjunct, my health insurance was threatened. The Welfare Fund had been footing the bill for CUNY’s underfunding for years and could no longer do so. I will also never forget the turnout—full-time, part-time around the block, signs and voices in unison, protesting for secure adjunct health insurance—as the CUNY Trustees met to determine our fate. That's when I realized: when we, the Union, say “all out,” it's all out! Showing our solidarity now means we will not be broken; we will build on what's been won and we will have a contract we're proud of. I'm voting yes for strike authorization because the CUNY faculty owes it to its students to stand against an ideology of austerity that justifies divestment from the public at every turn. A university cannot function, let alone thrive, without a fair contract for its faculty. I am proud to teach writing and literature to our diverse and brilliant students, and I’m proud to form part of the vast community of people demanding adequate support for public education in New York. I am voting yes not just based on our economic claims for a decent union contract after so many years without one, but because of the fundamental need to be treated with respect by management. This university is supposedly run on a model of shared governance, and yet the budget is controlled by highly paid administrators and sanctioned by politicians whose priorities are not supportive of a sufficiently funded public higher education system. As faculty who are committed to the public good, we need to maintain our dignity and scholarly autonomy. A just contract and a livable wage in one of the most expensive cities in the world is a basic necessity, not a privilege. I'm voting yes for the strike authorization because, unfortunately, I believe that we have no other recourse. I came to Queens College in 2004, and in 12 years, I have not had a raise in half my time at CUNY. When I left my position as a high school teacher in Long Island to come to Queens College, I took a cut in pay of over $30,000. I never could have imagined that after obtaining a PhD, my pay would drop so substantially and never recover to what I would be earning if I had remained teaching high school with a master’s degree. We are the most poorly paid professors in the New York metropolitan area, and it has to stop. I’m voting yes for the strike authorization because I believe in public education. I know that the strike authorization is the best chance that the PSC-CUNY has of ever getting the raises that we desperately need and deserve so we can continue to serve the working-class families of New York City and provide affordable quality public education for all New Yorkers. I am voting YES because I support our union's efforts to take an offensive and proactive role in fighting the nonstop austerity politics that dictate higher education in our state and in our country. While it is personally difficult to deal with six years of no contract, it is even more important for myself and the larger CUNY community, especially the students that we serve, that we reject the idea that there isn't enough money to properly fund accessible and high quality higher education for our students, who come from the working classes of New York City and surrounding areas. We are in a period of budget surpluses, yet Albany is not willing to sufficiently fund the CUNY campuses, and instead seeks to pass financial burdens to students via tuition increases or through budget cuts that reduce our ability to serve the students. By voting yes, we are strengthening the position of our union as it bargains for a better deal not only for PSC members, but also for the students and the larger communities that we serve. By voting yes, we are standing up for one the most important institutions for social justice and equality in New York City and we refuse to accept the starving of CUNY as "business as usual." In the upcoming strike vote, I urge my fellow union members to consider all these reasons and join me in voting yes on this important vote. There’s a misconception that support for a strike vote is just about salaries for our faculty and staff. In truth, it’s so much bigger than that. The PSC and my fellow members are fighting not for ourselves, but for the future of our city. The failure to negotiate a salary that can build, support and maintain an excellent faculty is part of a long term pattern of disinvestment in a commitment to affordable, accessible quality education for all people regardless of gender, race, class, religion, national origin or ability to pay. This commitment, made first [in NYC] with the establishment of City College in 1847, expanded nationwide by President Lincoln with the state Land Grant colleges and built upon with the GI Bill and other programs that opened up opportunity, created a vibrant middle class, transformed immigrants into citizens and led to over a century of innovation in nearly every field. Here at CUNY you see that legacy: Andrew Grove, a Holocaust survivor and political refugee helped create the modern computer industry. Jonas Salk ended the scourge of polio. Arno Penzias discovered the origins of the universe in the Big Bang theory. They aren’t alone. In nearly every aspect of modern life you’ll find a constant thread of those who went to CUNY or whose parents did and enabled them to do better than their grandparents and build a better world. Disinvestment in public education threatens this vital legacy. The PSC has been a constant and active opponent to this, not just arguing for wages to support excellent teaching and learning, but fighting for lower tuition, better physical plants and more overall funding to improve the execution of the mission of the University. In many cases, the PSC has been more vocal and more effective in supporting CUNY and getting things done than the administration, fighting to roll back massive budget cuts proposed by hostile city and state administrations. Disinvestment starts with you not having a contract. It ends with us standing up and making it clear that isn’t acceptable. I encourage you to vote yes, not because we want to strike, but because we want to make it clear that we support a strong, vibrant CUNY for our students and our communities. I have worked at Brooklyn College since 2000. The students I work with are mostly low income, immigrant, first generation, people of color and women. Just like me, many of them are the first in the family to attend college. Education, in my grandmother’s words, is the best way to get out of poverty. Students I work with intuitively understand how Brooklyn College has impacted on their lives. My students’ day-to-day struggle resonates with me, and gives me a deeper understanding of my own personal experience. This is why I have chosen to work at Brooklyn College for 16 years. The CUNY Administration and Governor Cuomo’s refusal to settle a decent contract for six years has gone too far. The persistent cuts to CUNY funding damage every single aspect of our students’ educational life. The facilities are deteriorating, class size is getting bigger, classes are cut, and worst of all, students are forced to pay more into tuition and numerous hidden administrative fees. The austerity politics of Governor Cuomo and the CUNY Administration claims that we could do our job more efficiently with less money and less staff. The reality is staff and faculty are the backbone of CUNY and we have sustained the system with meager pay, and insufficient funding for years. My operating budget has been cut over 50% in the past 16 years, while the number of students I directly serve has increased by the hundreds. As an educator, I have devoted my life to the students I serve. A decent contract is the minimal amount of respect, Governor Cuomo and the CUNY Administration should give my colleagues and me. I will vote YES for the Strike Authorization Vote and I hope you will join me as well. Education cannot only be the privilege of the wealthy. As a nation we must support and build the public sector. This includes adequate and appropriate conditions for faculty, staff and students in CUNY, where the future of the people of our city is imagined and created. I no longer believe that CUNY management or the State of New York have remained faithful to these principles. In fact, I believe that these principles are being actively undermined. Ultimately, the values and priorities of an institution are reflected in its budgets and how people are compensated. It is abundantly clear to me that students and faculty are not the priority that they should be and that they are not afforded the dignity and respect that they deserve. Sky-high administrative salaries, administrative bloat, and misplaced priorities are undermining CUNY’s core mission. On a personal level, working at CUNY has been professionally and financially very damaging. I have come to realize that working at CUNY is only possible if you have made money before taking a job here or if you have a good second stream of outside income. CUNY management is aware of all these challenges, especially as they relate to compensation and working conditions, and yet there is no urgency in finding a meaningful resolution. This is why I will vote “YES” on the strike authorization vote. By authorizing a strike, we are re embracing our collective power. Sure we all want to teach and come to work. I want to. I love teaching at City Tech. Hopefully, this strike authorization vote compels management to move toward a fair contract as a similar authorization did in California. The PSC negotiating team has been through hundreds of hours of negotiations; we’ve marched, signed petitions, and made calls. But CUNY management has failed to budge. Since our last raise, the rent has gone up in New York, costs of living have increased, and few of us go a pay cycle without running out of money to pay the bills or going into overdraft just to get the groceries. It time to let CUNY management know that we are willing to use direct action to compel the university to address our economic needs. Direct action gets the goods. In “Letter from a Birmingham Jail,” MLK suggested that nonviolent civil disobedience fosters the sort of creative tension that moves bodies to re imagine situations, breaking impasses. There are those who would suggest the PSC should wait out the crisis. The question of patience with the status quo permeates through the "Letter from a Birmingham Jail.” MLK states, "My friends, I must say to you that we have not made a single gain in civil rights without determined legal and nonviolent pressure. Lamentably, it is a historical fact that privileged groups seldom give up their privileges voluntarily… We know painfully through experience that freedom is never voluntarily given by the oppressor; it must be demanded by the oppressed. Frankly, I have yet to engage in a direct action campaign that was "well timed" in the view of those who have not suffered unduly from the disease of segregation. For years now I have heard "wait. "… This "Wait" has almost always meant 'Never." We must come to see, with one of our distinguished jurists, that "justice too long delayed is justice denied." With tuition rising steadily and salaries failing to keep up with costs of living, we have to acknowledge that "justice too long delayed is justice denied." Many CUNY faculty and staff are being priced out of the city we serve. Rising housing costs take a large chunk out of our paychecks, and many faculty and staff are forced to live far away from the campuses where we teach. We do a demanding and inspired job of educating students to help them to a prosperous future. What happens to our pride of vocation when we face long, draining commutes or undesirable (or unaffordable) housing? When we face a lack of respect? I’m voting YES to the strike authorization vote because it’s time we join hands in solidarity and say Enough. To provide a solid education for our students, those who will be the powerful engine of our city and state, we need job security and a sound contract. Being paid a respectable wage for the work we do is at the heart of a decent quality of life. CUNY is historically an extraordinary institution, a vital part of New York City. Without respect, it crumbles. Respect, Governor Cuomo. Respect, Chancellor Milliken. R-E-S-P-E-C-T. I am voting YES for the strike authorization vote, because I believe we have the right to deny our labor if CUNY refuses to pay for it. Enough has been written and said about the under-appreciated and under-compensated work we all do at CUNY. We all know we deserve better! Five years without a contract, six years without a raise—this fight is definitely not about some far-fetched demands. It is about respecting the work we do and committing the resources necessary to keep it going. If CUNY, NYC and Albany appreciated our work and were truly committed to public education, we would never need to consider a strike. But in the face of these political machinations and underfunding of public education, we the workers have no choice but to vote with our feet. Denying our labor is the only thing we can do. The law that makes this illegal is questionable at best. One’s labor should never be coerced. We are the ones doing the work at CUNY. We are the ones not getting our fair share. This is why we have a union and this is why we should support it. Unionized labor has been under constant attack in our country from its inception. Without it, we would still be chained to machines in a factory. So this is why I am calling on everyone to join me in voting YES. I am voting "Yes!" because what matters to me, what matters to all of us, relies on progress; and without "Yes!" we recede from our better chances and hide from the possibilities. So, I am voting "Yes!" for my wife and daughter, my colleagues, and my students. I am voting "Yes!" because I believe in all of them. Here’s why I’m voting YES on May 2: As I’ve been speaking with HEOS on my campus, I’ve met degreed professionals with years of experience who are forced to live paycheck to paycheck. I’ve met people who have been working uncompensated overtime every week for years because there isn’t enough funding to fully staff their offices. I’ve met people whose passion for the work they do and the place they do it has been all but extinguished by financial stress and the stifling dose of disrespect the lack of a contract represents. I’ve met people who thought they could spend the rest of their working lives serving CUNY students, but who are now desperately trying to leave because they cannot afford to stay. Nobody wants to go on strike. But we’ve tried every other tool in our toolkit to no avail. The rallies have helped. The civil disobedience has helped. The petitions and postcards and phone calls and emails and trips to Albany have helped. But they haven’t helped enough, and here we still sit, working harder than ever for salaries that are more than half a decade out of date while the cost of living here continues to skyrocket. The problem isn’t that the state can’t afford it. We know Albany has the funds to let CUNY make us a good offer. The problem lies with CUNY leaders who cannot or will not fight hard enough to get what we need and ambitious Albany politicians building their political brands at the expense of CUNY students and the staff and faculty who serve them. The disrespect they have shown us is absolutely breathtaking. It’s time to vote yes on strike authorization. What other choice have they left us? A contract lapsed for more than half a decade with low salaries, uncompetitive workload and job insecurity for the majority of the workforce is not a matter of happenstance. The reliance on tuition to carry almost half the cost of running a public university does not happen by accident. The plight of our contract is a casualty of the systemic defunding of CUNY undertaken with cold political calculation. It is an attack on the students we serve, our students, the vast majority of whom are economically underprivileged, are racial minorities and immigrants. If our working conditions are their learning conditions, then the dominant political culture does not consider them worthy of a good education. What choice do we have but to fight back? And if negotiations, lobbying, street demonstrations, and acts of civil disobedience are not enough, we must escalate. Since Strike Authorization is a fight for justice for ourselves and for our students, I'm voting yes. I'm voting YES because I feel it is wrong, a moral outrage to be working 6 years without a raise. My rent has gone up. My health insurance has gone up, but my salary has not. That is an outrage. I'd like to retire in a few years but I can't afford to do that until we get a decent raise. I have worked at BMCC over 20 years, first as an adjunct and now full-time. I feel angry and betrayed and disrespected. I'm shocked that management called an impasse. I appreciate how hard the Union has been fighting to get a contract and I support their efforts. Sometimes events in life require one to take a stand, to take a risk- and that's why I am voting YES. It is the right thing to do. While no one wants to go on strike, I believe we must vote by a strike authorization, to stand in strength and solidarity as faculty, students and staff, to defend the legacy and assure the future of the City University of New York against austerity and privatization. In a nation in which public education has become a political football, and in a state enjoying a surplus, we must advocate boldly for the CUNY as the academic soul of the city. 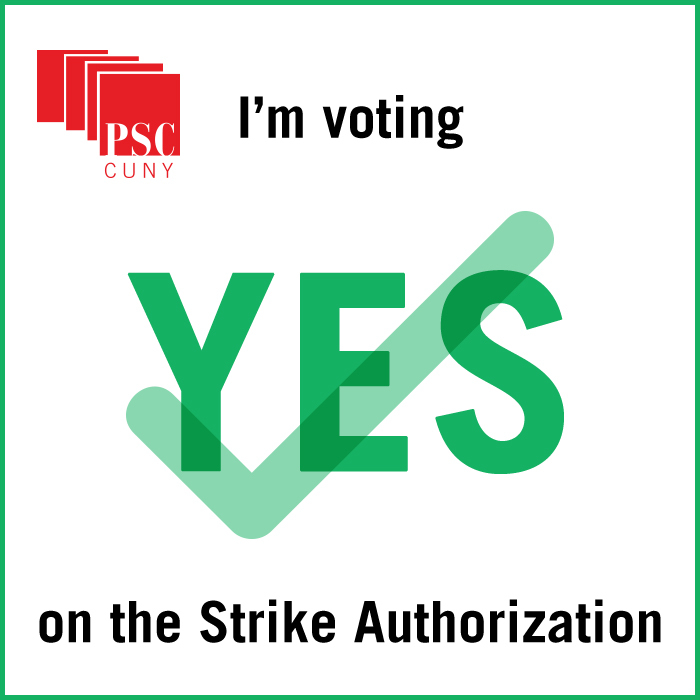 As a member of the PSC /CUNY, I'm voting yes on the strike authorization vote. Personally, I am reluctant to strike, but if I am forced to strike, it will be because the CUNY administration is not listening to my concerns. I believe employees have the right to fight until a successful contract is settled. For example, the cost of living rose 23% in New York City between 2009 and 2014; and our salaries have continued to stay the same and to deteriorate for the past 6 years, due to the lack of any increases. This has put my family at the risk of finding themselves in an unhealthy living environment. Therefore, unfortunately, I must chose to vote for strike authorization for a new contract in order to support myself, my family and my fellow employees. To ensure CUNY heeds our requests, the union requires a lion's share of our members to take the next courageous step. … I am voting “YES” for strike authorization because that is the PSC’s only viable option at this point. I am voting “YES” for strike authorization because the focus should be on the inability of the State to take action on this issue, not placing blame on the members of our union, who ask to be heard. The Governor and CUNY management have sent an unmistakable message to CUNY faculty and staff by not negotiating our contract for the past six years, thereby not affording us a living wage. That message is: You do not matter; the work you do is not of value. When we are charged with educating CUNY students, many of whom are working-class and who are struggling themselves, we have to send back an equally unmistakable message: The work we do is valuable—and we want fair compensation for that work. We do this work for CUNY students—who are also of great value. I am voting “YES” for strike authorization because not only is working under “austerity conditions” an economic hardship, but it allows me, as part of a collective voice, to demonstrate to CUNY students just how valuable they are – the literal core of our work – and to send a message, across the board, that this strike authorization is the only viable option. In 1994, I became the Brooklyn College English department’s first hire after 20 years of austerity and a long hiring freeze. It was a time of great demoralization coupled with a cautious excitement, with CUNY’s intellectual and creative future truly on the line. Then came more hires of an extraordinary cohort of younger scholars, a generation behind my own, who have worked passionately in the classroom and alongside the PSC to ensure which side of that line we would stay on. I felt I had caught a wave of deep and mutually reinforcing beliefs and commitments– to my students and colleagues, to my own field of poetry, and to the future of public education in a great university rebuilding itself. BC’s fantastic diversity undergirds and spurs a profound and important interdependence: our students do not take their education for granted; they are charged by our pluralism, by their curiosity about each other, and by their insights into a complex world in which intellectual and creative work matter. These human realities and meanings are at the core of education’s purpose. But the last 6 years at CUNY do not speak to the future. Instead they suggest that our vision, our mission, and our human values have been lost to a numbing politics. The State’s myth of austerity is a cover for a regressive agenda we who came to CUNY in the early and mid 90s believed would be overcome. We still believe in our mission, and our collective power to alter the future. But CUNY can no longer convincingly claim any real philosophical or intellectual investment in its own future, or in the futures of our students. The future cannot be built on an ad hoc basis. The future cannot be built by devaluing the human collective and enterprise at its center. In the end, for me, the strike authorization vote is a statement about the credibility of the institution as a whole. I am voting YES in solidarity with my students, my extraordinary colleagues, and the promise of their future. I am voting YES for the restoration of good faith and collective purpose, and in opposition to the bad faith that has been holding our university – and our students’ futures – hostage for far too long. I am voting YES to signal my commitment to the path that brought me to Brooklyn College and CUNY to begin with. Colleagues, by now you should have received in your inbox and/or by mail, a ballot to vote “YES” or “no” to empower our PSC-CUNY union leaders to call a strike should we come to that juncture. I am writing to ask you to vote “YES.” I could ask this as someone who began as an adjunct in the CUNY system in 2005, dedicated to the institution’s mission to serve the city’s working class students, paid only a few dollars less per course as our adjuncts are making now. I could ask this as a former substitute instructor, who taught 8 courses in a fiscal year while finishing a dissertation, parenting a newborn and earning a salary that considering the local cost of living and rounded for inflation, was barely a living wage. I could ask this as a former tenure-track assistant professor, who while balancing research and writing, 6-7 courses a year, departmental and committee work, student mentoring and advisement, wondered how he could both meet these increasing demands and stay on top of family obligations. I could ask this as a now-Associate Professor, tenured and published, with student loan payments on the back burner of priorities, living without a raise in six years in one of the most expensive, rapidly gentrifying cities in the United States. But I won’t. This is not a decision made lightly. We have an obligation to our students to provide them with the best possible education. And it is our duty to educate them to be empowered and involved citizens who will stand up and fight for what is right—even if it not easy. To be counted and heard, sometimes a hard choice has to be made. We, as faculty and staff, must strive to ensure that our students are not further damaged academically by the lack of a contract. If we indeed have to strike, I can’t help but feel that the students will be proud to know we are fighting for change, for social justice and for them. That can only help in the long run. I’ve taught as an adjunct at Lehman since 1997 and in that time my per-credit hour salary has gone up $35.35. I’m supporting the vote to authorize a strike to remind CUNY management Governor Cuomo and the New York State legislature exactly how low my salary is and how desperately I and fellow adjuncts need a raise. The CUNY’s refusal to sign a new contract with salary increases demonstrates its continual disregard for the value and quality of the teaching and guidance we have consistently provided, despite our minimal salaries. I’m voting to authorize a strike to demand that CUNY and Albany acknowledge our contribution to the CUNY system by giving us a contract with the salary increases we have earned. I'm voting yes because I care about the future of my students, of myself and of the whole country; because without proper, steady and good quality education and teachers, no entity can progress! I began my career as a New York City public elementary school teacher. I have made a career-long commitment to public education. When Queens College hired me after earning my Ed.D., I was so proud to continue serving public education. Our students are exactly the students who deserve the best we can offer in terms of teaching, service, and research. Moreover, I can't think of a better investment of public funds. In my department alone, we prepare teachers and educational leaders, and many of them also stay to serve in the New York City public school system. They continue the efforts to provide educational excellence to our city's children. It is discouraging, however, that my standard of living now is less than when I began, and certainly less than I would have earned had I remained all these years in the New York City public school system. For all my commitment and devotion to CUNY and public education, it frankly feels disrespectful. We all deserve better. That's why I'm voting YES! I’m voting YES! for strike authorization because 6% is an UNACCEPTABLE offer. The only offer CUNY made to PSC was in October 2015 for 6% over 6 years (2010: 0%; 2011: 0%; 2012: 0%; 2013: 0%; 2014: 1% on April 20; 2015: 1% on April 20; 2016: 3% on April 20; and 2016: 1% on October 19). Our last raise was in October 2009 and our contract expired in 2010. Our salaries have not kept up with inflation or cost of living adjustments. Since 2010, the inflation rate has compounded to 8.6%. Accepting an offer of 6% means that we are taking a salary cut. The past bargaining patterns of the all other NYC municipal unions included a 4% raise in 2010. PSC members deserve that 4% as well. The offer CUNY made to the PSC denies us that. We are fighting for fair pay to end the wage gap. We are fighting against continued attacks and attempts to erode the public higher education institution of learning, namely CUNY. We are fighting for a better future for our students and children. We are fighting for political, economic, and social justice. “We do not inherit the Earth from our Ancestors, we borrow it from our Children.” –Ancient Indian Proverb. The PSC has been working very hard (e.g., protest, rallies, demonstrations, letter writing campaigns, lobbying in Albany, civil disobedience leading to arrest to name a few), to win a fair contract for all its members. I’m not willing to accept the 6% offer. Are you? Will you join me in voting YES? I am voting “Yes” because I think it’s a disgrace that a person with a Ph.D. and 20 years’ experience teaching on the college level should be teaching three courses a semester and still be earning a poverty-level annual salary of $20,000. This is my story and that of many, many other adjuncts who now struggle to give our students the fine education they need and deserve. CUNY is blatantly exploiting us, and I rely on the PSC to negotiate a contract that addresses this disgraceful injustice. But in order to raise our salaries to something more decent and appropriate for the highly skilled work we do, I know that the city and state governments and CUNY must provide sufficient funds, and so far they haven’t done so. CUNY's financial offer has thus far been woefully inadequate. Therefore, if it becomes necessary to take extreme measures in order to achieve justice for ourselves and for our students, whose learning conditions are adversely affected by our working conditions (such as, in the case of adjunct faculty, abysmally low salaries, lack of job security, lack of time—because of having to run around from job to job, lack of office space, and much more), so be it. In 1974, after earning my M.A at Columbia University, I began teaching at CUNY. As an adjunct lecturer at Lehman College, I earned $1,500 per course. A Brooklyn College graduate, I was happy to return to CUNY as a teacher. A year later, I became a teaching assistant at Columbia, where I taught as a teacher and preceptor until finishing my doctorate. I also attended Columbia University Law School and have been practicing law for almost 25 years. Since fall 2005, I’ve also been adjunct assistant professor of English at Hunter College. Today’s beginning adjuncts earn $3,000 per course. That’s about 40%, in real dollars, of what I earned 40 years ago. With a Ph.D. And J.D., and decades of experience as a teacher and attorney, CUNY pays me only about 60%, in real dollars, of my 1974 adjunct’s salary. The salaries and benefits of K-12 NYC public school teachers have kept pace with inflation, and more so. Other government workers — police officers, fire fighters, civil servants — earn salaries that reflect today’s economic realities. Yet CUNY teachers, both part- and full-time, have fallen far behind the economic curve. Our students need us; CUNY needs us: and we need a raise. After 6 years with no contract, and contract offers that ignore the reality of 40 years of diminishing returns, I voted, reluctantly, to authorize a strike. NYC and NYS must face economic reality: pay the teachers!